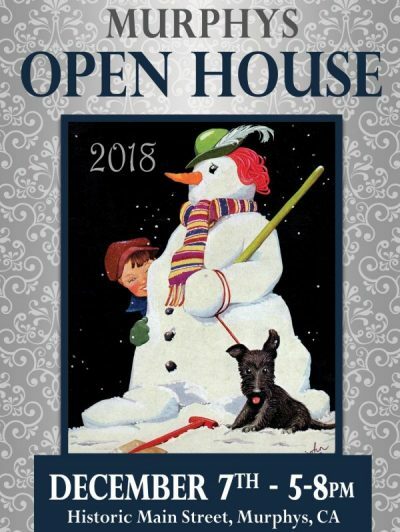 Murphys will be celebrating the start of the holiday season with our Annual Open House on the first Friday in December featuring a parade, live music, photos with Santa, shopping, treats and more. Join us around the firepits and in the shops, restaurants and tasting rooms for an evening that is sure to get you in the holiday spirit. Main Street will be closed to traffic from 4:45-8:15 pm and parking spots are likely to be in short supply, so please get here early to grab a prime viewing spot for the parade which begins at 5:30 pm. The parking lot at the Black Bart Playhouse will be closed beginning at 4 pm to allow for parade staging in the parking lot and along the stretch of Algiers in front of the Community Park. Public parking is available at the Old Schoolhouse on Jones Street, at the Masonic Hall on Church and on the surrounding streets. Please be careful not to block private driveways or public roads, we’d hate for your car to get towed away! Carolers are always welcome, just show up and start singing!